Bugs in the Kitchen gets their moment in the sun, then runs from it 'cause they're bugs and all and this analogy has gone far enough... uh... experts at Play Board Games. 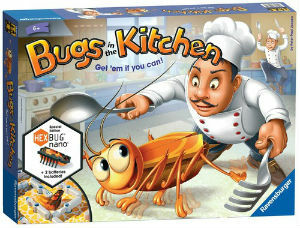 Bugs in the Kitchen is a dexterity game that kids and grown-ups can both enjoy. Can you trap five bugs before your opponents?